Domestic violence in the United States is a public health problem that requires the involvement of all members of the community to recognize, address, report, and prevent. Healthcare professionals are in a unique position to be able to recognize domestic violence because of how closely they may work with the victims. 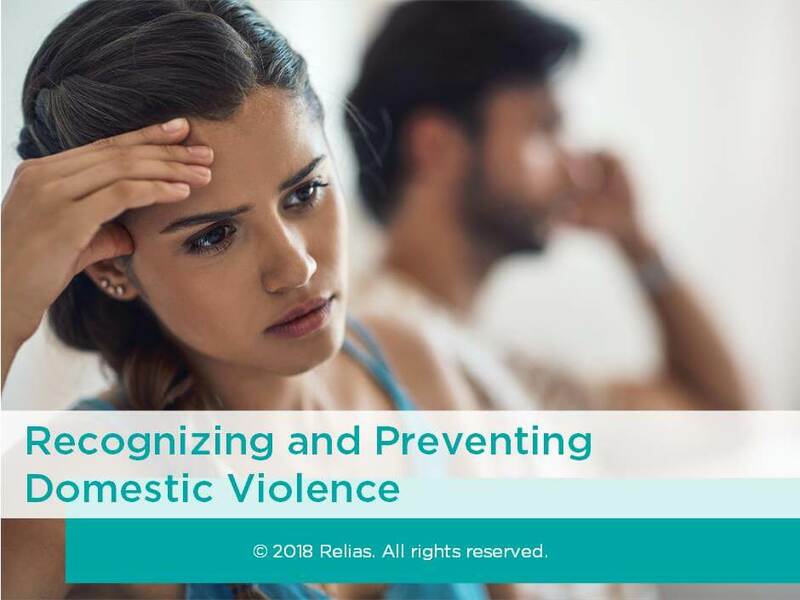 This course provides information on recognizing and responding to domestic violence and presents strategies you can use to report and even prevent it. Describe domestic violence in the United States as a public health issue. Define 2 types of domestic violence. Identify 3 risk factors for becoming a victim of domestic violence. Describe 5 warning signs of domestic violence. Illustrate 3 strategies you can use to assess for domestic violence. Demonstrate 3 interventions for responding to and reporting domestic violence. Explain 4 ways you can help prevent domestic violence. Section 1: Introduction A. About This Course B. Learning Objectives Section 2: Domestic Violence in our Society A. Lorna B. Domestic Violence Defined C. Intimate Partners D. Prevalence E. Incidence F. History of Domestic Violence Laws G. Current Laws H. A Public Health Issue I. Impact J. Consequences - A Deeper Look K. Review L. Summary Section 3: Types of Domestic Violence and Becoming a Victim A. Types of Abuse B. Stalking C. Risk Factors D. The Cycle of Violence E. Becoming a Victim F. Review G. Summary Section 4: Recognizing Perpetrators of Domestic Violence A. Profile of an Abuser B. Behavior C. Tactics D. Typical Pattern of Behavior E. The Cycle of Domestic Violence - An Example F. Review G. Summary Section 5: Recognizing Victims of Domestic Violence A. Recognizing Potential Victims B. High Risk Factor Groups C. Clues, Injuries, and Behavior D. Physical Signs and Symptoms E. Behavioral/Psychological Signs and Symptoms F. Verbal Clues G. Barriers to Revealing Domestic Abuse H. Review I. Summary Section 6: Strategies for Healthcare Professionals A. Screening, Responding, and Reporting B. Screening C. Screening Tools D. Victim Questioning Strategies E. Indirect Questions F. Direct Questions G. Responding H. Reporting I. SOAP J. Classifying Abuse K. Staying Safe L. Domestic Violence Programs M. Prevention N. Review O. Summary Section 7: Conclusion A. Summary B. Course Contributors C. Resources D. References E. Congratulations! Staff Writer: Jennifer W. Burks, R.N., M.S.N. Jennifer W. Burks, R.N., M.S.N. earned her Bachelor of Science in Nursing from The University of Virginia in 1993, and her Master of Science in Nursing from The University of North Carolina, Greensboro in 1996. She has over 25 years of clinical and teaching experience, and her areas of expertise are critical care and home health. Her professional practice in education is guided by a philosophy borrowed from Florence Nightingale's Notes on Nursing, "I do not pretend to teach her how, I ask her to teach herself, and for this purpose, I venture to give her some hints." Disclosure: Jennifer W. Burks, R.N., M.S.N. has declared that no conflict of interest, Relevant Financial Relationship or Relevant Non-Financial Relationship exists. The target audience for this course is: entry and intermediate level Social Workers; entry level Administrators; entry level Nurses; entry level Physicians; entry level Speech and Language Pathologists; in the following settings: Post-Acute Care.